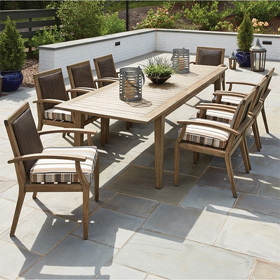 A sleek modern design, durable aluminum frame, and comfortable sling seating make this set a stylish and comfortable addition to any outdoor dining area. This set includes seating for eight and table with ample room for refreshments. Two of the chairs in this set include motion bases for gentle swiveling and rocking motion. All chairs in this collection feature OW Lee's new Flex Comfort seating surface which provides both cushion like comfort and the ease of maintenance found in slings. The Flex Comfort Sling does not retain heat, quickly repels water, and can be removed for cleaning or replacements. Pieces in the Studio collection include rocker dining arm chair, sectional pieces, and lounges. This luxurious product comes with free shipping and your choice of frame, sling, and table top color. Lifestyle Photo: Shown in Coastal Grey Frame Finish with Silver Flex Comfort Sling and Oxyde Dark Table Top. Swivel Rocker 24.25"W x 25"D x 35.50"H 38 lbs. Dining Arm Chairs 24.24"W x 25"D x 35.75"H 29 lbs. Dining Table 86.5"W x 44.5"D x 29"H 285 lbs.